It isn’t quite the Summer of 2010, the new reduced movie ‘tax credits’ have chased many of the bigger movies away, but the industry in Michigan is hanging in there, and for movie stalkers, this has been a pretty good couple of months. Of course the Big News right now is Transformers 4 which has already been filming in the state for a month or so, but this week is due to start filming at the awesome set that has been constructed in Grand Circus Park, right in the center of our bankrupt city. Even those who rail against the tax credits have got to find this just a little bit cool. And as I’ve wandered around talking to crew, so far ALL of them are Michigan hires. Trust me, this is not just a way of ‘sending money to Hollywood millionaires,’ this is a program that really does employ local people and pump a lot of money into the local economy. Rant over. So this week there will be traffic chaos, explosions. cool cars and Mark Wahlberg. Doesn’t get much better than that. You can find the filming schedule all over online. But essentially July 30 through August 8 right downtown under the People Mover. Follow the crowds, the detour signs and the sounds of explosions. You can’t miss it. Probably keeping a lower profile is Division 19 starring Neve Campbell, which also starts filming in Detroit this week. We don’t know where yet, but watch this space and Twitter, and of course OnLocationVacations for updates. Meanwhile in Ann Arbor, the Bollywood movie Writer’s Block continues to film with star Saif Ali Khan. Why Ann Arbor? I honestly have no idea! And on a smaller scale, the movie Papou (Mother and Midwife Pictures) has begun filming around the Northville/Novi area. We missed out on Iron Man2, RoboCop2, The Avengers and the last Batman movie, but I saw a rumor a while ago that there were plans to snag a ‘major comic-book movie’ for Detroit. Still waiting to hear on this one. Man of Steel 2 maybe? Looks like the release date for The Double has slipped until the end of October. Other Michigan movies out in theaters right now include the Ides of March and Real Steel. It’s hard to believe these were being filmed here just a year or less ago, and harder still to see how things have changed since. The Michigan Film Office has run out of money for this year and is no longer accepting any applications. We just heard that we lost Iron Man 3 to North Carolina, and who knows how many other movies that could have brought millions of dollars and hundreds of jobs to the State will now be filmed in Ohio and Illinois and North Carolina and Lousiana. I’m going to say that again, louder… MILLIONS OF DOLLARS AND HUNDREDS OF JOBS. In fact movies will be filmed anywhere other than here, because despite what the naysayers keep nay-saying, 41 states, including California, have some kind of film incentive. Yes, even California has a film incentive! Why? Because they know it wastes tax payer money? I’m guessing (and this is, you know, a wild and crazy guess…) because when movies are filmed in your town and State, it brings in MILLIONS OF DOLLARS. There are still a few small movies planned for the next few months, but as much as I support these ventures, they are not the ventures that are going to build a movie industry in Michigan. They aren’t the projects that are going to keep young graduates from fleeing the State to the coasts. They aren’t the projects that are going to put Michigan on the map for anything other than urban collapse and an auto industry that is hanging in there, just. Yes, this makes me cranky. My own State Senator, Senator Mike Kowall, may not agree with me on some other issues, but he is trying to introduce a bill that will restore the incentives in some form. The bill will set aside $100 million rather than the current (already spent) $25 million, and give more oversight and transparency to the program. There are other things I’m not so happy about like a clause which states that the movie ‘must show Michigan in a good light.” Really? I’m thinking that if someone wants to spend say $160 million to film in burned out buildings in Detroit, we should hug them and take their money. But we do need to restore the program and put some real commitment behind it so that we don’t look flaky and unreliable — which we currently do. Right now no one wants to commit to filming here when the whole program looks uncertain. S.B. 383, sponsored by state Sen. Mike Kowall, gives the Michigan Film Office the ability to negotiate the size of incentives it offers to film, television and video game producers. Under current law, the incentive program is strictly defined, resulting in fixed incentive percentages the film office must offer and greater expenditure of taxpayer money than necessary. With this change, the film office may offer productions lower incentives packages than the current automatic 42 percent subsidy. By having the ability to offer varying levels of support, this change will also give the state more ability to ensure the incentive program creates jobs for Michigan residents. The legislation is now P.A. 77. I only hope that sanity prevails, and this bill passes, because, Lions and Tigers aside, Detroit and Michigan could use a break right now. Meanwhile, remember when we were rubbing shoulders with Topher and Richard? 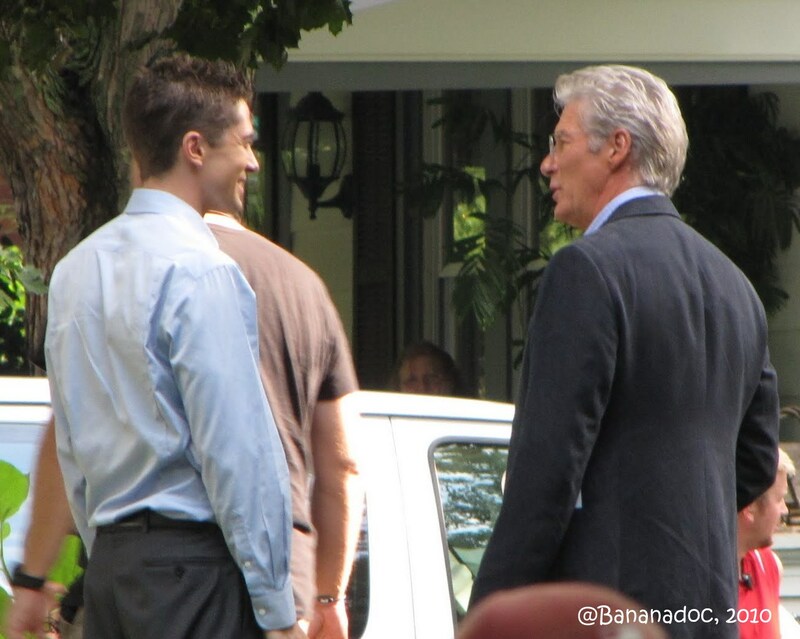 …it’s so very cool to have Richard Gere and Topher Grace in my friend’s backyard. Really. My views on the Michigan Film Incentive would not be influenced by such superficial things. New Ernst & Young Report Shows Positive ROI From Michigan’s Fast Growing Film and Television Industry – NBC29. This blog is not political, however, I can’t let this issue go unmentioned. As many will know, the Governor elect of Michigan, Rick Snyder, has proposed to remove the Michigan Film Tax Incentives that have brought so many movies to Michigan in the last 2 years. This decision is clearly a political one, but was backed up by what appear to be some poor studies that have been done on the effectiveness of the tax incentives in terms of return on the $. There are plenty of sites that are now discussing these incentives, explaining what are and what they have achieved. There is a grass roots campaign starting up with the aim of reversing the Governor’s decision. A majority of people in Michigan are in favor of the incentives. During the elections the Governor himself indicated that he would not pull the rug out from under the industry, but that is exactly what he has done. Many people, myself included, find this to be a staggeringly stupid decision given the current economic climate in Michigan. Those involved in the movie industry in Michigan in any way have known instinctively that this is a Good Thing for the state. Websites are full of personal stories and anecdotes detailing the positive impact of the industry on individuals and companies in the state. But stories and anecdotes alone aren’t going to sway those interested in the bottom line. Finally, only 2 days after the Governor announced his budget proposals, we have a detailed report from Ernst and Young that show how incredibly well the incentives have worked. They have brought money and employment. Even if your only fundamental interest is the bottom line, this has to be enough evidence that these incentives are worth the investment. If you are in Michigan, I would urge you to write to read the report and then contact your representatives to get this point across. There’s a lot of hate out there for the incentives, but even the haters have to look at the real, tangible numbers and see that they make sense for Michigan. Stick to the facts, save the vitriol (although I may share some of it, it isn’t going to help the cause). The incentives have brought money and jobs to a state in desperate need of both. They’ve also brought hope, which is harder to quantify and put on a spreadsheet. But hope will lead to more people investing, more people staying in the state, more jobs, more people paying taxes. Guess what that leads to? More dollars. Bottom line: The Michigan Film Incentives are good for Michigan. Don’t let them be dismantled before we have a chance to see how much better they can be if they are given longer to work. The Dark Detroit Rises As The Bat Signal May Illuminate From The Broderick Tower Of Gotham City In Batman III. Will the Bat Signal emminate from the Broderick Tower in Detroit? What a cinematic opportunity to showcase the 45 abandoned skyscrapers in Detroit as it becomes Gotham City Redux. via The Dark Detroit Rises As The Bat Signal May Illuminate From The Broderick Tower Of Gotham City In Batman III..